Two seasoned mountain bikers stopped beside the trail for a drink. Covered in mud and exhausted from pushing themselves, they watched as a tiny tot pedalled past. The beauty of the Forest of Dean cycle tracks is that they really do cater for everyone. Here’s what you need to know before you pump up the tyres and head for the hills. 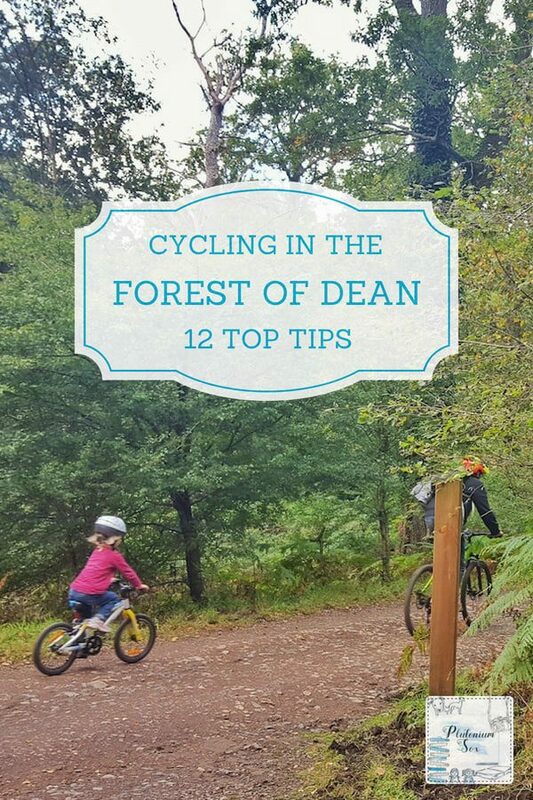 There are various locations in the Forest of Dean to pick up the cycle trails. Head to the tourist information website for links to the different routes. Alternatively, you can pick up a cycling guide map. Cannop Cycle Centre Near Coleford (see below) is a convenient starting point for mountain bikes, with both a café and parking. The tracks there offer a suitable challenge for cyclists of all abilities. For road cycling, you could head to Monmouth to pick up a 52Km route. One of the things I love about the Forest of Dean is that not having a bike doesn’t have to stop you from cycling. Both Dean Forest Cycles in Parkend and Pedal a Bike Away at the Cannop Cycle Centre offer bike hire. I remember cycling in the Forest of Dean as a teenager and it was tough! There were some massive hills and challenging terrain, perfect for experienced cyclists. So you can imagine my surprise when my husband suggested taking our five and three year old for a bike ride there. The youngest has been able to ride a bike for less than a month. And yet, the family cycle route from the Cannop Cycle Centre was perfect. This is a nice, easy route made up predominantly of flat, relatively smooth paths. It is eleven miles long, but we managed the whole route in an afternoon with plenty of rest stops. This is a bit of a weird one isn’t it? Nevertheless, there are A LOT of wild boar in the Forest of Dean. However, the main thing to remember is never to approach them, particularly when they are with young. They can’t see very well but will hear or smell you. If you move towards them, they may perceive this as aggression and charge you. Dogs have been attacked by wild boar in the forest so it is wise to keep them on a lead. It is rare to see wild boar as they tend to keep out of the way of humans. However, we were chatting to someone on our bike ride who had just seen a sow and ten hoglets crossing the path. I know, these are everywhere right? But in the Forest of Dean, they can be particularly dangerous. You will come across walkers, runners and cyclists of all different abilities on the trails. We’ve never encountered any unpleasantness or dangerous behaviour from any of them. Sadly though, we did encounter people on off-road motorbikes going too fast along the family cycle route. They weren’t wearing helmets or paying any consideration to other trail users. Our advice would be that if you hear motorbikes coming towards you, get off the track and out of the way. They will doubtless end up killing someone, the best case scenario would be that it’s only themselves. If it’s your first time in the Forest of Dean, I would probably advise heading to the Cannop Cycle Centre first. It is on Forestry Commission land on the site of an old colliery. You’ll find all the information you need about both the area and cycling as a whole. There is a café with good albeit somewhat overpriced food and plenty of seating. They run regular cycle events and there are clubs for both children and adults there. It is the start for the family cycle route and there is plenty of car parking. There are several challenging routes there too, including downhill trails. For these, you can get a lift to the top rather than cycling up the route, which can be somewhat narrow in places. There is also a pump track and advanced skills area, both useful for coaching. I’m fully aware that mountain biking isn’t for everyone. 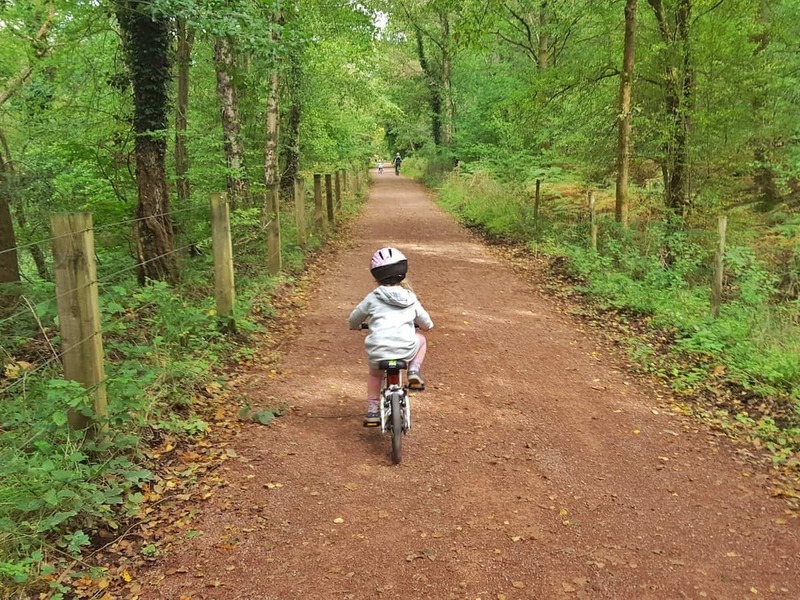 So if you’re heading to the Forest of Dean with family members who aren’t cyclists, they might prefer to go for a run or have a stroll around the trails. The routes are just as suitable for running and walking as for cycling, you just have to be aware that you will be passed by cyclists. I didn’t take a bike when we went with the girls. This was for two reasons. Firstly, at the pace the girls cycle at, it was much more beneficial for me to have an 11 mile run than an 11 mile cycle. Secondly, my three year old hasn’t quite mastered using the brakes yet, so I ran alongside her on the family cycle trail. When she’s able to manage without so much input from me, I’ll probably start bringing the dog along for a run until my daughter is too fast for me to run with her. Let’s face it, this is one of the main reasons for visiting the area. And yet, when you’re on a mission to cycle from A to B, it’s easy to forget to take in the beautiful scenery. 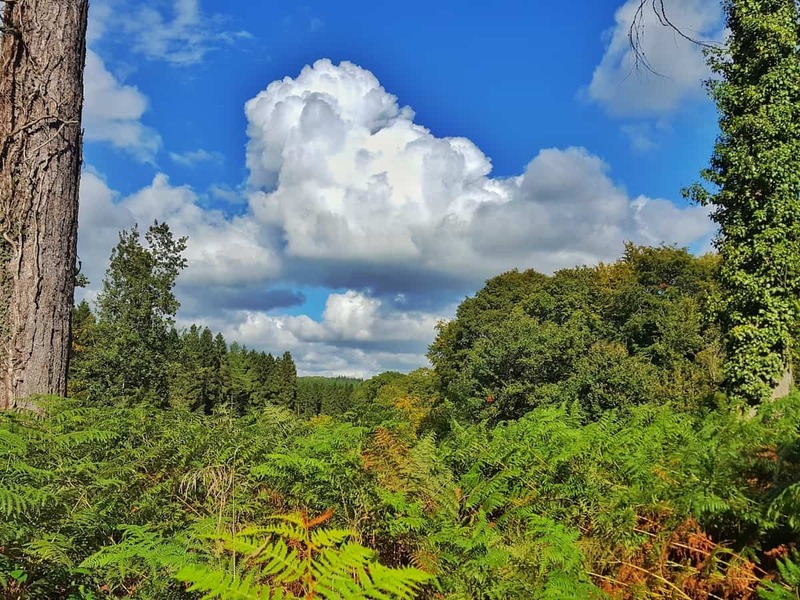 The Forest of Dean is a stunning landscape with trees, undergrowth and water. The trails often run alongside the River Wye and it’s a lovely place to be. Sadly though, we did see quite a bit of litter along the route. Please remember to take all rubbish with you and leave it as you would like to find it. If you’re cycling with children, they will enjoy it more with plenty of time to rest and catch their breath. We even took the time to stop and play along the route. 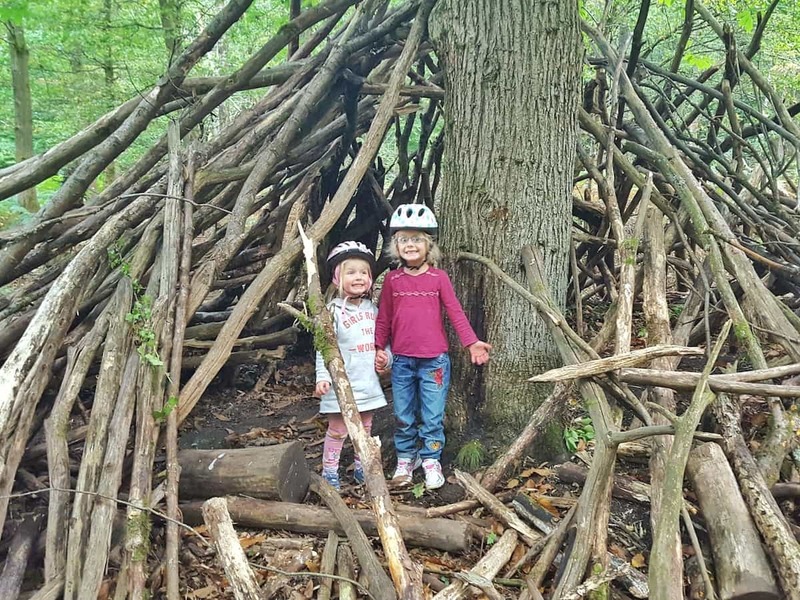 They loved playing in this den and there’s even a park towards the end of the trail. The track is incredibly well signposted, perfect if you’re worried about getting lost. There are short deviations around the route that offer something a little more challenging. For example, you can deviate from the family cycle track to take in some small, bumpy loops. 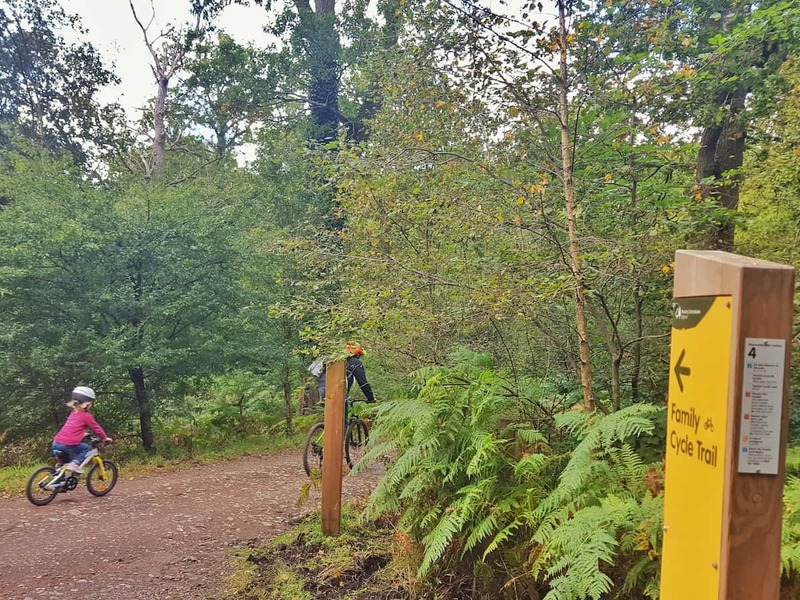 Each one rejoins the trail a short distance away, so more experienced riders can test themselves before catching up with the rest of the group. If you’re travelling from further afield, there are lots of great places to stay in the Forest of Dean. We tend to camp if we’re there for a few days, staying at the well-equipped Bracelands campsite. This has modern, clean toilet and shower facilities and welcomes cyclists. 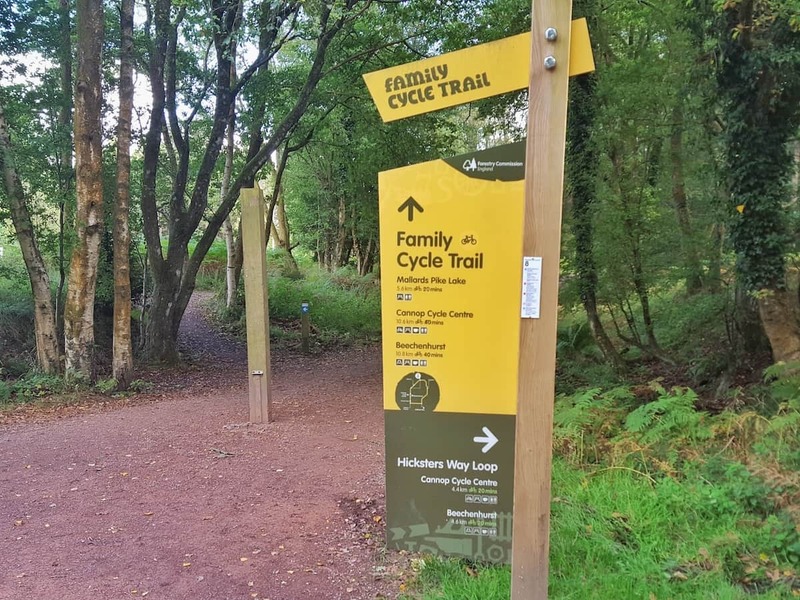 There are plenty of cycling trails that start near to the campsite and it accommodates both tents and caravans. For a little more luxury, you could try Forest Holidays. Many of their luxurious log cabins have an outdoor hot tub. Perfect for relaxing after a hard day cycling! The Forest of Dean is one of the best places I know for outdoor activities. Forest Adventure is a great place to start. They offer everything from bushcraft to kayaking to caving and much more besides. For something a little more sedate, you could try the Dean Forest Railway. They run both steam and diesel trains and even offer a day out with Thomas on particular dates. Other ideas include a maze, Gruffalo trail and Go Ape. There are lots of brilliant ideas on the Wye Valley tourist information website. Previous Post Making the right purchasing decisions with Which? Great tips! 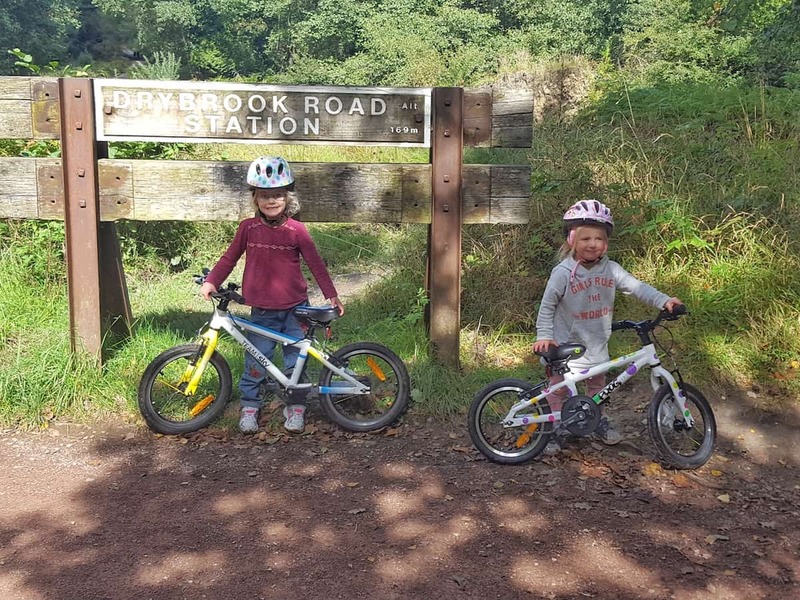 I’m so impressed that your girls managed an 11 mile bike ride at an age when most kids can’t cycle at all. I had to laugh at your ‘arseholes’ section, even though the message was serious. 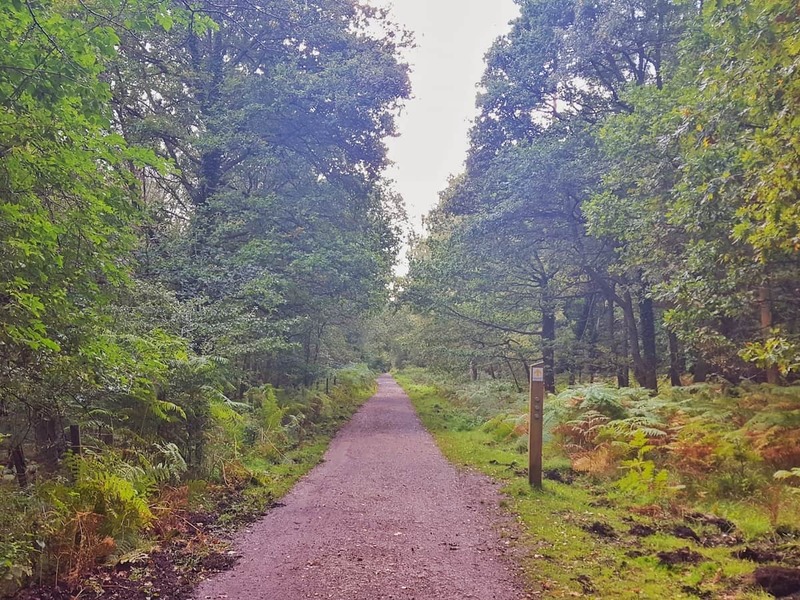 I’m really pleased I found this blog post as I’m looking for autumnal friendly ideas to get out on a bit of an active adventure before it gets too cold. Never been to the forest of dean… it looks gorgeous. Hi Nat, what a lovely place to cycle, run or walk and how fantastic that you were able to have a good family afternoon, bet the girls slept well after! Unfortunately, there will always be thoughtless prannies who don’t have an ounce of consideration for anyone. When we went walking on the mainland we were warned about wild boar and aggressive they can be, I would still have loved to have seen one, but would have used my zoom to get up close! Ah that’s lovely, it’s wonderful when they learn to ride a bike isn’t it? Your girls are so good! My eldest has yet to learn *hides face* Great tips for the area and such a stunning place for a ride! Ah never mind, it’s definitely something they need to do when they’re ready. Oh that’s great to hear, it is a lovely day out. Wow 11 miles that is impressive – well done to your girls. This is a great post – we just need to figure out how we transport 5 bikes now to get over. Is the hire of the bikes very expensive? Ooh good question, I’m afraid I didn’t check. We have a bike rack you could use if you decide to go and want to collect it. It takes 4 bikes then hopefully one would fit in the boot?